Add chicken, tuna, tofu, nuts or other sources of protein. Use any kind of vinegar or substitute lowfat Italian dressing for the dressing ingredients. Reduce sodium by leaving out the seasoning packet. 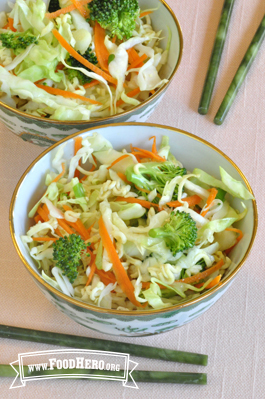 In a large bowl, combine cabbage, broccoli, carrot, green onions and uncooked ramen noodles. For the dressing, combine ramen seasoning packet, vinegar, sugar and oil in a small bowl. Stir well. Pour dressing over salad. Toss to coat. Refrigerate until served. 1 Comments for "Chinese Ramen Cabbage Salad"
Napa cabbage, sometimes called "Chinese cabbage," would be good in this, too!